Description: The subject was a prototype Warrior Class Guyver Unit, the first in what would have been the ultimate class of combat armour for the Creators, if not for the intervention of the Guyver Zoalord. The subject has since bonded to the mysterious “MATRIX” from Warrior Guyver 2’s alternate reality and acquired a Gigantic Warrior Unit as well, code named “Dreadnought”, and is now considered one of the most powerful beings known to exist. Once again making the Warrior Guyver our greatest hope in defeating Chronos once and for all. Special Note: The subject has gone rogue, details of incident are classified, and is no longer an agent of ACTF. However, subject is still a declared enemy of Chronos and may still assist ACTF forces when our goals are the same. ACTF agents have thus been informed to use their best judgment on whether the subject can be trusted, on a per mission bases, or whether subject could pose a threat and take the appropriate action to ensure mission security, if possible. ACTF Agents have also been advised to take the subject’s extremely high power level into account during any and all encounters with him. Present estimates of this Guyver type abilities have been compiled and summarized below. -Physical Strength: Base level is approximate to 2,500 men, with a power boosted max. equal to 4,000 men. Stamina is unlimited unless power boosted for longer than 15 minutes at a time. This results in a critical strain upon unit that causes the Gigantic armour to automatically deactivate. Host unit then reverts to its pre Matrix form and power level. This condition can last several minutes before subject regains his full power and can again activate the Gigantic armour to become Dreadnought. -Triple HSL Power System: Subject, in his Gigantic form, is equipped with three separate HSL power systems. The three systems work together to enhance host Bio Boost to far greater than normal levels and is only limited by host/unit tolerance levels. Power Boost is achieved by temporarily overriding Unit’s energy generating safety limits and increasing generated power by ~60%. Normally this would result in the destruction of host body in a matter of minutes but Subject’s Matrix can maintain Unit/Host Stability for up to 15 minutes before it is overloaded. Unit thus reverts to a base power level before host body is destroyed and remains in that state until Subject’s Matrix returns to full functionality. Power impairment can also be caused by damage to either Host and/or Gigantic Control Medals. -Durability: Subject can withstand a 5 kiloton explosion with nothing more than his armour and body shield. 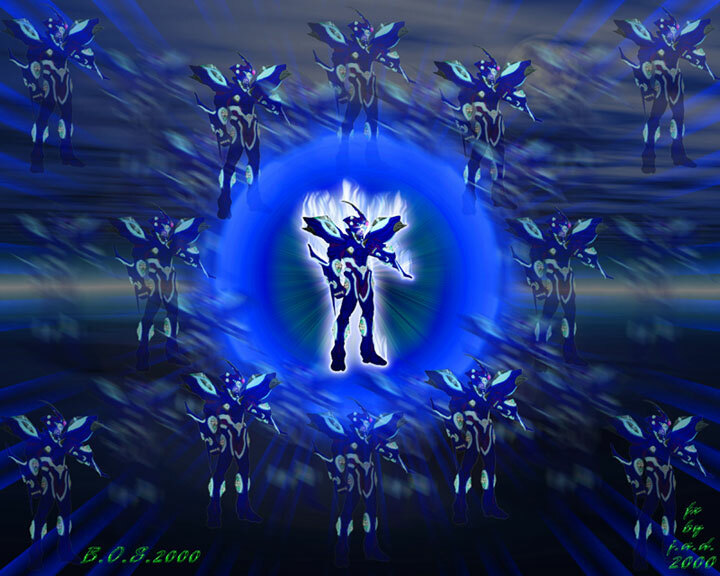 Even if damaged the subject can regenerate 400 to 1,000 times faster than a normal Guyver and automatically adapts to new threats, making it increasing more difficult to damage subject during battle. The activation of shields increases durability to a level that allows subject to withstand anything up to a 25 kiloton explosion. The subject can also focus all his shields in one direction and combine it with his power boost to allow him to withstand anything up to a 60 kiloton explosion. Use of the gravity shield can rapidly boost this level and can, given time, raise shielding to a level that can withstand a multi-megaton level nuclear explosion. But Subject’s ultimate defensive system is the ability to generate a Quantum Matrix shield/field, a multi-dimensional/spacial quantum energy flux field, that renders subject virtually impervious to attack. Subject can withstand anything up to a 10 Gigaton explosion with this ability, but requires several seconds for field to be established and the only weapon the subject can use in that state is the Matrix bomb, a weapon too powerful to be used under any normal circumstances, so is rarely used in full combat situations. Subject can also focus energy shield system to enhance the body shield into an ablative virtual matter armour layer. This allows subject to interact with object(s) while maintaining optimal defences. Effect can also be combined with Stealth abilities to make subject appear defenceless or to enhance an illusion. -Speed: Running = 0-7,500 MPH and up to 15,000 MPH when power boosted. Flying = 0-37,500 MPH, up to 75,000 MPH with units’ back thrusters, and max. speed increases to 375,000 MPH when power boosted. Reflex speed is 1,000 to 4,000 times normal and up to 10,000 times normal when power boosted. In space, the subject can use his quantum powers to travel at the speed of light and/or use power from his gravity shield to allow him to travel at faster than light speeds for either a short burst of up to 10,000 times the speed of light or a prolonged burst at only a few multiples of light speed, though this later ability is rarely used since the subject usually just teleports any great distances. The subject can also create wormholes and use other methods of FTL travel such as quantum slipstream and dimensional shifting. -Quantum Speed: Ability the subject has developed that allows him to instantly move from one location to another at will and without travelling through an intermediate medium such as hyper space. Since no measurable amount of time passes when this ability is used, subject can appear to be in two or more places at once. -Quantum Time: A state the subject can go into when using his Quantum Speed ability, allowing him to exist within a single instant of time. Though unable to effect anything in this state, as he passes through normal matter like a ghost and is unable to affect anything with his powers, he can use this ability to analyze a situation and combine this ability with his quantum computing power to allow him to be absolutely certain of his choice of action upon re-entering normal time. He can also use this ability to simply meditate and think of things without worry of the passage of time. -Teleportation: Subject has the standard ability to perform hyper space jumps that both the Warrior and Gigantic class Guyvers possess, but, since merging with the Matrix, the subject can now utilize all known forms of teleportation. Including quantum, trans dimensional, matter/energy, worm hole, and psionic methods. -Quantum Inverse Teleportation: Ability the subject first demonstrated on a Grakken mother ship when he used this ability to trans locate the ship with an equally massive Creator ship. Essentially allowing subject to teleport objects more massive than he can normally teleport, by switching them with an object of approximately equal mass. The subject can also use this ability tactically, to switch places with either an opponent or ally at will. -Molecular Manipulation: A mostly psionic based ability that allows subject to manipulate matter at will. This allows subject to both move an object and/or alter it, such as turning lead into gold or changing the shape of an object. The full range of this power has yet to be demonstrated. -Quantum Phasing: Ability the subject has developed that allows him to move through solid objects like a ghost or make himself as impervious, and as unmoveable as a 200 ton diamond. The subject can also use this ability to travel to parallel universes by changing his quantum frequency to match that of one of the parallel universes. -Quantum Fusion: Subject can use his Matrix to temporarily transform a being into their quintessential essence and thus absorb that being into himself, adding that being’s powers and abilities to his own. This allows subject to bypass his own limitations but can only use this ability for up to 15 minutes before the fusion destabilizes and the being returns to its original state. This ability can also be combined with power boost to maximize effect. The subject can also experience a partial increase to his own bio-boost power if fusion occurs with a genetically compatible being. -Gravity Shield Weapon: Subject blast field can channel and store gravitational energy from both himself and any external source. A weapon of incredible destructive potential, it is what ultimately allowed the Warrior Guyver to defeat the first Guyver Zoalord. The subject can call upon this powerful weapon at will for either defence or offense. Allowing the Warrior Guyver to either withstand or administer a nuclear scale attack. The subject can also use this shield to absorb power from gravitational attack(s) made upon him. Now merged with the Matrix, the subject can use this power to warp the very fabric of reality but the true range of this ability has yet to be determined. -Quantum Beam Orbs: These powerful energy weapons can generate a beam with up to 400 times the power of a normal Guyvers head beam, giving it twice the destructive power of a standard Guyver pressure cannon. Subject has five of these orbs, one in place of the normal Guyver head beam orb, one on each forearm, and two smaller orbs on either side of subjects Control Medal that have half the power of the other orbs. Energy output of all orbs double when subject is power boosted. Subject can also channel additional power from units power wave attack to boost the orbs power output by over 250 times normal maximum, allowing subject to quickly fire multiple Mega Smasher level beam attacks. The quantum energy beams can also be adjusted at will to induce different effects upon target(s), ranging from a simple laser like burn through to a death ray like effect that causes target to either vaporize or explode. -Gravity Control Orbs: Subject has 5, each 40 times more powerful than a normal Guyvers. This allows subject to fire multiple pressure cannons, each 80% of the power of a single Guyver mega smash. This, combined with subject’s bio-energy, allows subject to produce a triple Hyper Mega Pressure Cannon attack, from both hands simultaneously, each with the destructive power of a 2 kiloton explosion of TNT and can be fired on up to six different targets at a time. When Subject combines power into a single triple blast combo, the destructive energy delivered doubles to 4 kilotons per blast. This can be further enhanced by combining the triple blast into a single immense blast, equal in power to a 15 kiloton explosion of TNT. The subject can also fire Zoalord type black hole and gravity bullet attacks on a par with the abilities of a Master Zoalord. All of these Gravity based weapons can be enhanced by the subjects Gravity shield to produce extremely powerful attacks. Use of the power boost ability doubles the base destructive power levels of these attacks. -Quantum Hyper Smashers: Similar to standard Gigantic hyper smashers, but uses a quantum energy field to produce a multi-dimensional/spacial flux energy stream of immense destructive potential. These weapons can fire a combined blast with 25 times the power of a Gigantic Guyvers Hyper Smashers and can be maintained for a full ten seconds. The radius of the beam is the same as a normal Gigantic Guyver’s, giving it a much greater range and penetrating power than its power alone would normally provide. 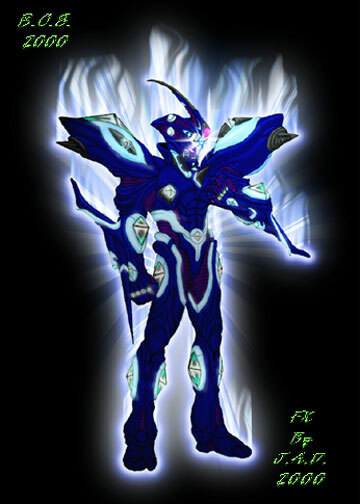 When power boosted, and combined with the energy focusing power of subject’s power wave attack, the energy output of these weapons increase to 60 times the power of a Gigantic Guyver’s Hyper Smashers, or simply channelled into enhancing one of subject’s other abilities. There is also no energy loss when subject fires these weapons individually so even one of his hyper smashers can fire a blast from 12 1/2 to 30 times the power of a Gigantic Guyver’s full double hyper smash. -Power Wave: Subject can channel the total power of his gravitational, energy shields, bio-energy, and blast field power into a directed blast that can be either fired two handedly, at two different targets, delivering up to four times the destructive power of a Gigantic Guyvers Hyper Smashers to each target, or into a single beam equal to ten times the destructive power of a Gigantic Guyvers full double Hyper Smash blast. This attack can also be used to temporarily super boost the subject’s quantum hyper smashers to nearly 35 times the power of a Gigantic Guyvers Hyper Smashers and up to 60 times when combined with subject’s power boost ability. The only downside to this ability is that it draws its power from the subject’s defensive systems and so makes subject more vulnerable to attacks when used. -Ultra Power Wave: Similar to normal Power Wave but power from the Quantum Hyper Smashers are also added to temporarily double the power of the power wave attack. Though rarely used, this ability allows subject to compensate if he, for any reason, can’t use his Quantum Hyper Smashers and/or needs extra power for a quick attack, though the use of the Quantum Hyper Smashers is better, this boosted attack still allows subject to fire an instantaneous blast of up to 20 times the power of a Gigantic Guyvers Hyper Smashers. -Power Punch: Attack is similar to a standard Gigantic Guyvers’ Power Punch, but maximum rate of acceleration is equal to 400 G’s, and delivers a blow approximately equal to a 5 kiloton explosion, per punch and can deliver up to two at a time. -Hyper Power Punch: An enhanced version of subject’s Power Punch. Channelling subject’s full power, in his power boosted state, to increase acceleration to 1,000 G’s and delivers a blow approximately equal to a 20 kiloton explosion, per punch and can deliver up to two at a time. -Tsunami Wave: The subjects ultimate power wave attack, channelling the total power of subject, combined with his gravity shield and power boost ability, to produce a single power punch style attack with the destructive power of a 50 Megaton nuclear explosion. The down side to this incredibly powerful attack is the several minutes it takes to charge up and the massive strain it puts on the subject. Resulting in the deactivation of the Gigantic armour and causing the host unit to revert to its pre Matrix form, for up to a minute. The range of this attack is also limited and requires a fairly close proximity to target. Consequently, the subject either has to time his attack precisely, or hide the fact he is charging up for this attack with his cloaking and holographic powers, in order to effectively deliver this attack on any target powerful enough to require the use of this extremely powerful attack. -Matrix Bomb: Subject, when in a near total vacuum environment like the void of space, can use his quantum energy shield/field to produce an extremely powerful explosion of energy. The effect is generated in a process similar to that used by a dimensional coupler and combined with the subject’s quantum energy field to produce a zero point energy effect that finally results in a massive 100 Gigaton explosion. Since this explosion is omni-directional, the subject has little choice but to only use this weapon as a last resort, since it would instantly vaporize both enemies and allies within several light seconds of his position. The extreme power of this attack, combined with the unique energies used to produce it, makes it deadly to even beings capable of travelling through dimensions like hyper space. Thus making it one of the few weapons that can instantly kill even a Warrior Class Guyver. Subject also can produce even more powerful explosions with this ability and/or focus the immense energy released by this attack, if subject is enhanced by quantum fusion with a being of at least near equal power to his own. -Hyper Swords: Subject has two pairs of elbow and forearm vibrational swords, composed of polymorphic material that allow it to morph into a variety of shapes and sizes at the users will, which have superior strength and tolerance levels than that of any other known vibrational weapon. Additionally, these weapons benefit from subject’s rapid adaptability and energy channelling ability. Swords can thus counter even the more powerful plasma swords of super beings such as the W’Kar and/or to help subject to penetrate a target’s defences. Also, like other Gigantics, subject can extend swords into tendril like whips for long range attacks of up to a hundred feet. -Hyper Sonic Busters: Matrix enhancement grants subject’s sound weapon emitters a 5 to 160 degree radius of attack, covering the full spectrum of sound, and can produce a white sound blast 100 times more powerful than a normal Guyver’s. Allowing Subject to easily kill anything up to a hyper class zoanoid. The emitters can also be used for a variety of effects, ranging from affecting the biological functions of a target, such as disrupting the inner ear to destroy a target’s sense of balance, to levitating objects. The emitters can also fire kinetic energy pulses for added punch and/or use in the vacuum of space. Subject’s Matrix can also augment this weapon to produce other effects, including disruption of dimensional harmonic frequencies, or simply converting its kinetic energy into an alternate form of energy. -Hyper Sensors: Range has been estimated to be vastly improved since subject merged with a Matrix, even more so in subject’s Gigantic form, and has been estimated to be around eighty kilometres (~50 miles). This combined with an advance multi-sensory HUD type system, the Control Medal’s A.I. capacity, and overall enhancements of all of the subjects’ natural senses, with Creator like telepathy added, allows subject to have a nearly god like awareness of his environment. Subject can also tap his Matrix enhancement to allow him to perceive different layers of reality or utilize quantum worm holes to scan a distant location that would otherwise be beyond the range of his senses. -Control Medal: In his Gigantic form, subject’s control medal is a larger, 3 layered, version of his normal Warrior Unit Control Medal. Each layer is composed of 4 partial C-Units that have been combined to produce a more powerful parallel processing Unit. The Matrix is merged with the top centre piece of the Control Medal and has become an integral part of the whole unit. Granting the subject greatly enhanced power and some of the powers associated with the Matrix itself. Such as the ability to remove or heal other Guyver Units of all types. The subject has also gained the ability to Quantum Compute during combat, allowing subject to calculate the results of all possible actions instantly and then choose the course of action that best suites his need at any particular moment. The subject can even use this ability to sense possible outcomes and react before an event happens, this combined with the subjects already incredible speed makes him almost impossibly fast, as well as incredibly deadly in combat. -Stealth Systems: Unit can turn invisible or appear to be just about anything, like a chameleon, with an advance cloaking system integrated with Unit’s Body Shield system. Unit can also project immaterial and/or solid holograms and, as Dreadnought, can make one powerful enough to handle anything up to a standard Elite Zoalord. The Unit’s ability to enter Hyper space without deactivating and taking host along with it for either teleportation or to regenerate from a battle, even if Unit had appeared to have been vaporized, is also integrated into the Unit stealth system to prevent its detection until host is ready for combat once again. -Psionics: Subject possesses Creator like telepathic abilities as well as other psionic abilities described above. This has allowed the subject to communicate with beings he would otherwise not understand and has demonstrated a limited command over the Creators standard Kavzars. This combined with the power of the Matrix, allows the subject to travel to other dimensions and times at will. In his Gigantic form, the subject has even demonstrated the ability to prevent other beings from teleporting while within an approximate ten to fifty mile radius from him. -Quantum Reflection: Subject can use his quantum based powers to bend the quantum laws of reality and allow him to create a quantum duplicate of an object and let them co-exist for an unpredictable length of time. Used on himself, this ability allows him to be in two places at the same time but the affect is unstable as only one version of an object can ultimately exist in the same universe, this limits the usefulness of this ability. -Other abilities: Subject can use his quantum powers to manipulate all forms of energy, allowing subject to guide his blasts to his target(s) and/or transform energy from one state and into another, such as transforming an incoming energy blast into gravitational energy that he can absorb with his gravity shield to increase his defensive abilities. Subject can also use this ability to transform energy into matter and vice versa. The only limit to this ability is that it can only be applied to energy/matter within the subject’s power range. The subject can also use this ability to create an energy based solution wave (A special wave that can travel indefinitely without losing power) blast that he can use to repel an opponent and/or propel an object away from him at a rate equivalent to the power contained within the solution force wave. Since the wave doesn’t lose power over time, the target will be propelled by the wave until the target can either get away from the wave and/or the wave itself is countered or disrupted. Subject can even manipulate forces of nature and create powerful psionic and gravitational based attacks, such as Imakarum’s cyclone attack, but up to Master Zoalord power levels. Subject demonstrating his Quantum Matrix Shield/Field at full power.